Takumi Harada and his family moves to Okayama during spring break before his entry to Junior High School. On the baseball field, Takumi has enormous confidence in his ability as a pitcher, but socially he is a loner. A chronicle of the life of Yasui Santetsu, a 17th century master of go who turned his attention to astronomy and created a new calendar for Japan. The Japanese comic character angles for a legendary monster fish. Star-crossed lovers must fight on opposing sides in a battle that will determine the next Shogun. A samurai goes to extraordinary lengths to provide for his family. Top star Lilico undergoes multiple cosmetic surgeries to her entire body. As her surgeries show side effect, Lilico makes the lives of those around her miserable as she tries to deal with her career and her personal problems. A man is shocked to find out that after a deadly car accident involving his wife and daughter, his wife died, but her mind somehow got transferred into their daughter's body. Chinese soldiers in an ancient civil war get caught up in a fantastical quest to save the universe. Adapted from the successful play, the film takes place in the 19th Japan where a war between demons and their slayers is fought. Izumo, an Kabuki actor with a demon-slaying past, meets and falls in love with Tsubaki. However, something is not right as mysterious marks appear on her body as time progresses. At the same time, it is announced that Ashura, the queen of all demons, will be resurrected and bring destruction to the universe. Written by Ploy P.
Unbeatable, baleful, and sinister Ashura, Queen of the Demons, has a plan to dominate this world. The Japanese film "The Eyes of Ashura's Castle" is set in the chaotic nineteenth century Edo (later Tokyo) where humans, demons, and evil spirits coexist. The Demon Wardens, a secret society, is beating invincible undead in the city. In the midst of the war between human beings and demons, Ashura's assistant Bizan notifies demon slayers about the rebirth of the impregnable queen Ashura in Edo. 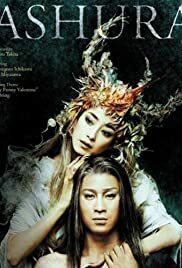 The story revolves around the ghostly, heartrending love relationship between dandy Kabuki actor Wakuraba Izumo and a beautiful thief named Tsubaki. He is a former star demon slayer, and she is graceful and fierce. While developing their romance, they cross a border between this world and the next, which triggers a disastrous outcome. Ultimately, their love and fate unfold by insinuating a common memory of the past that is the dramatic relationship between killing and being killed. Professional Kabuki actor Somegoro Ichikawa plays Wakuraba Izumo. He is the scion of the most famous Kabuki families whose tradition is much respected by many and recognized as one of the chief Japanese traditional art forms. His skillful and flamboyant swordplay is admirable. Rie Miyazawa, a popular Japanese actress, plays the mysteriously attractive yet ferocious Tsubaki. Directed by Academy Award winning film director Yojiro Takita, "The Eyes of Ashura's Castle" features a timeless range of cultural references to Japanese popular culture from romanticized eighteenth century Kabuki theater and its playwright Tsuruya Namboku IV's ghost stories to contemporary playful video games and computer graphics. Besides, the film skillfully adds exhilarating zombies with kimono costumes to Japanese pop music. A psychedelic mixture of old and new epitomizes the richness of Japanese popular culture. The prologue is particularly an eerie collection of some Japanese myths and ethereal symbols. For instance, a fireball is approaching to Edo while Emish, an ominous demon, is singing a parody of children's tune, "Toryanse." Further, signposts for ogres such as bridges, borders, and twilight are effectively employed. A ghost emerges at the edge of a bridge connecting this world and the next. Additionally, seas, rivers, and mountains demarcate the two worlds. Finally, the opening scene is twilight, which is a brief period of ambiguous time. It is a time of transformation from one being to another. Indeed, the times of uncertainty are chances for ethereal beings that are roaming around the human world. Furthermore, a parody of legendary horror playwright Tsuruya Namboku IV (1755-1829) plays a crucial role to unite the whole eclectic Japanese national and cultural symbols: Kabuki theater, Izumo's crimson thread magic, Tokubei's giant frog, stylized actions, and the undying Japanese ghost story, "Oiwa." Namboku produced many ghost stories for Kabuki plays, and also wrote about Tokubei's story. These cultural references from the early nineteenth century add an exotic character to the film. Consequently, the story unfurls a series of Namboku's fantastically weird tales, which include comedy, apparitions, love, tragedy, and disgust. A dreadful opening and a wonderful ending are key components of his story. Blurring this world and the next in the film, Namboku says 'which world you live in, the world has its own paradise.' The poignant story, where the lovers cannot fulfill their love in this world, clearly follows Namboku's traditional Kabuki taste. Overall, the film is entertaining and worthwhile watching.